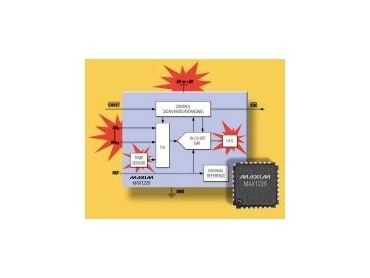 MAXIM Integrated Products, represented by Arrow Electronics , has introduced the MAX1226-MAX1231 and MAX1026-MAX1031 families of 12 and 10-bit analogue-to-digital converters (ADCs) with 8, 12, or 16 single-ended analogue inputs or 4, 6, or 8 true-differential analogue inputs. These devices minimise microprocessor I/O requirements by including an on-chip FIFO, scan mode, internal clock mode, and internal averaging. An on-board ±1 degrees Celsius accurate temperature sensor provides local temperature, eliminating the need for an external temp sensor. This reduces cost and saves board space. All features are accessed using a single port. The MAX1226/MAX1228/MAX1230 and MAX1026/MAX1028/MAX1030 operate from a single +5V supply, while the MAX1227/MAX1229/MAX1231 and MAX1027/MAX1029/MAX1031 operate from a single +3.3V supply. Low-power operation consumes only 1.8mA at the maximum conversion rate of 300ksps. Automatic shutdown between conversions reduces operating current to 330 microamps at 10ksps and no more than 5 microamps when the device is placed in complete shutdown. Along with high channel count and low power consumption, their high ac performance (THD < -82dB) and dc accuracy (±1 LSB INL) make these devices ideal for industrial process control, instrumentation, and medical applications. The 8-channel MAX1226/MAX1227/MAX1026/MAX1027 are available in a 16-pin QSOP package, the 12-channel MAX1228/MAX1229/MAX1028/MAX1029 are available in a 20-pin QSOP package, while the 16-channel MAX1230/MAX1231/MAX1030/MAX1031 are available in 24-pin QSOP and 28-pin QFN packages. All devices are available in both commercial (0ºC to +70ºC) and extended (-40ºC to +85ºC) temperature ranges.